RediClinic delivers high-quality, convenient and affordable healthcare that fits your lifestyle. Our board-certified clinicians in Missouri City, TX collaborate with local physicians to treat common medical conditions and provide preventive care on a walk-in basis, seven days a week. RediClinic staff treats more than 30 conditions such as: strep throat, ear infections, urinary tract infections, pink eye, and skin rashes. We also provide health screenings, medical tests, immunizations, and physical exams. 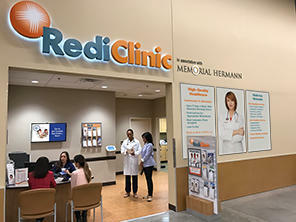 Come visit RediClinic Missouri City at 8900 Highway 6 to see how we work to keep our patients living healthy.